ATP today announced opening 5 new flight training centers and lower prices for flight training and certification programs. 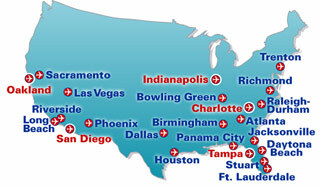 New flight training centers are planned for Charlotte, Indianapolis, Oakland, San Diego, and Tampa. San Diego will be the first to officially open its doors on February 9 at Montgomery Field (MYF). Specific dates for the other locations will be announced soon. ATP has also reduced prices by as much as 20% across the board for all its accelerated, multi-engine flight training programs. This price reduction will benefit pilots all across the US. More pilots come to ATP for their multi-engine ratings and airline transport pilot certificates than any other flight school or academy.